The most powerful couple of the United States, President Barack Obama and First Lady Michelle Obama talked about their Christmas gift rituals on Oprah's Christmas special at the White House. 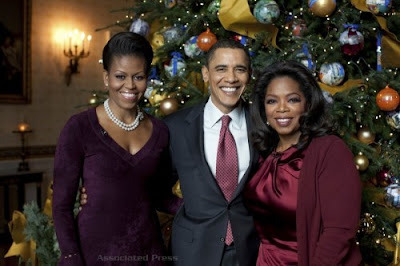 Oprah toured around the White House showcasing its holiday decorations- THE OBAMA WAY. Part of the interview, Mr. Obama said that he gives nicer stuff than he gets but then Michelle objected as according to her, she gave him good gifts last year. It's good to see the presidential couple talk about their personal stuff. The President even talked about his Holiday gifts experience from his early childhood days. Watch out for this once in a lifetime episode from the Queen of Talk this Dec. 13 at 10PM EST on ABC and see for yourself how the Obamas celebrate the holidays.